Recital Tickets On Sale NOW! 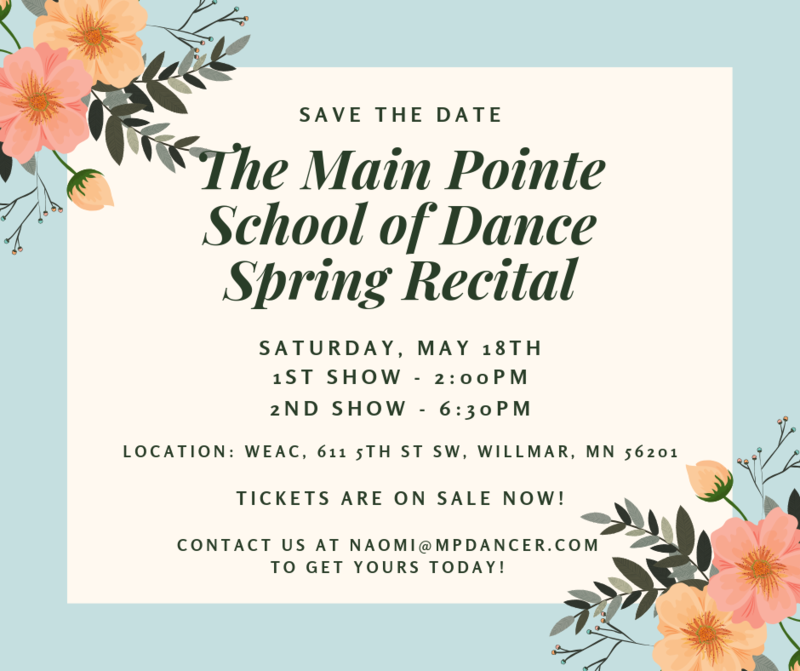 Recital tickets for our Spring Recital are on sale now! 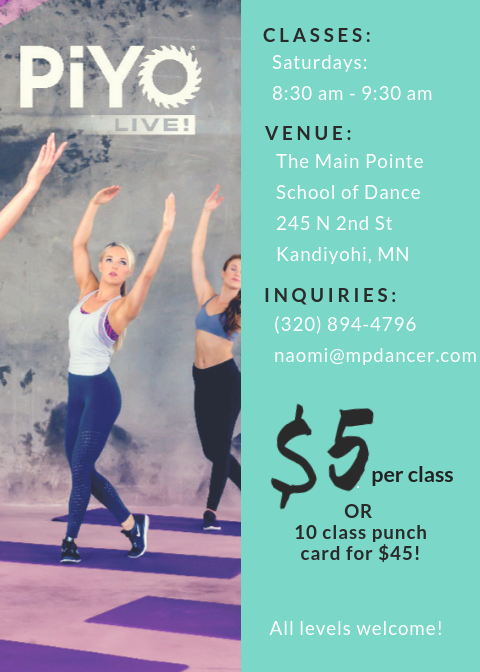 Contact us at naomi@mpdancer.com to get yours today! The Stingers Ticket Order Form is due back to me by next Thursday, March 21st. Please return form to me with t-shirt and ticket payment. Please make all checks payable to: The Main Pointe School of Dance. The registration form for our Hip Hop class is due this Thursday, March 14th. Class will begin this Friday, May 15th. Due to our lovely MN weather, Class pictures have been cancelled for this evening. HMD Photography was able to pull a few strings and form an opening for us next week instead. ALL THURSDAY CLASS PICTURES ARE RESCHEDULED TO NEXT THURSDAY, FEBRUARY 14TH. Please help spread the word! I apologize for the mess and confusion that this weather has caused us over the past few weeks. Thank you all for your patience and understanding! Stay warm everyone! The Main Pointe clothing order is now available online! The order is completely optional, but offers a little something for everyone! Make sure and check it out at http://bakergraphicsinc.tuosystems.com/stores/mainpointedance. There are samples available in the studio for a majority of the items if anyone is interested in taking a look! All orders are due by Sunday, February 17th! 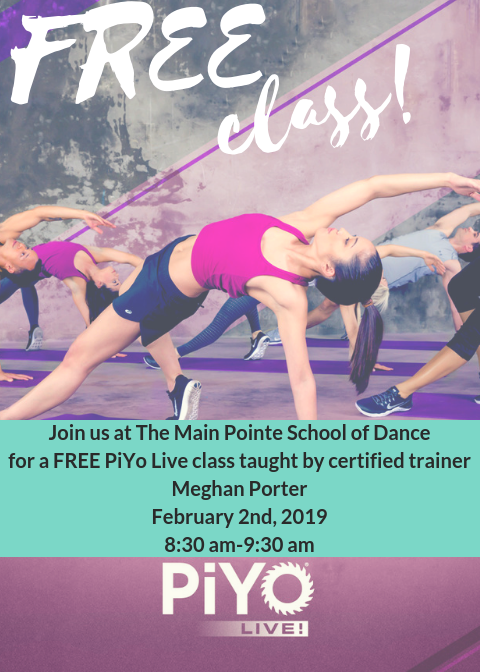 One of our very own dance instructors will be offering a new class at the studio starting THIS SATURDAY (02/02)! Classes are offered every Saturday from 8:30-9:30am. All you need is a clean pair of tennis shoes and a yoga mat (optional). See attached flyers for further information. Hope to see you there! Due to the area school cancellations and the extreme temperatures today, ALL CLASSES THIS EVENING ARE CANCELLED. Make-up class day TBD. Please help spread the word and stay warm everyone! Due to the area school cancellations and the extreme temperatures today, ALL CLASSES THIS EVENING ARE CANCELLED. Make-up class day TBD. Please help spread the word! Class Picture week will be held during regular classes February 4 (M), 5 (T) & 7 (TH). Please make sure your dancer brings ALL pieces of their costume for pictures. Hair can be worn however your dancer prefers for pictures that evening. Order forms for pictures will be distributed during regular classes within the next few weeks. We have rescheduled our missed class on December 18th (T) to January 22nd (T). All regular Tuesday classes WILL be held. Please let me know if anyone has any questions.